Please take non-empty campsize containers to the Eastern Regional Landfill for recycling. Empty campsize containers may be placed in a blue bag for recycling. Even if there’s a drop of liquid left in a gas cylinder, then the cylinder is still pressurized and can explode. The fuel also usually contains propane, which is flammable dangerous when touched or inhaled. Any cylinder that is not empty must be disposed of as hazardous waste. 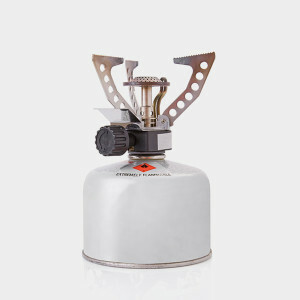 If your cylinder isn’t empty, either use up the leftover fuel on your next camping trip, or simply run your stove or lantern until there’s no fuel and the flame dies out. Make your empty cylinder appear safe to sanitation workers by puncturing it carefully. Lever the sharp, triangular point of a can opener against the cylinder’s bottom rim, then label it with a permanent marker as “Empty” and “Punctured”. The AMC describes more ways to safely puncture an empty cylinder here. If your cylinder contains words like “nonrefillable,” “disposable” or “single trip,” do not try to refill it. Federal law prohibits the transport of refilled disposable cylinders because the metal is stressed to its capacity with its first use, and becomes thin and likely to explode when further stressed. Yellowstone, Yosemite and Bryce Canyon National Parks all have propane cylinder recycling machines. If you are visiting one of these parks, dispose of your empty cylinder in one of their receptacles. Save money and reduce waste by choosing a refillable cylinder over a disposable one. They come as small as one pound and can last up to 12 years. Find a refillable cylinder with the ReFuel Your Fun campaign. The United States consumes approximately 40 million disposable gas cylinders each year. These cylinders, both dangerous and expensive to recycle, mostly end up in landfills, taking up close to 5 million cubic feet of space annually. If recycled, 12,000 automobiles could be made each year with the recovered steel. When you buy a disposable cylinder, 80 percent of the cost is packaging. Not only are refillable camping gas cylinders good for the environment, they save customers an average of $320 over their 12-year lifespan, assuming the cylinder is reused 10 times a year.